With only a couple of months to go before the general election, another key feature of Conservative policy goes into effect, as North West Trains Ltd take over the running of the rail network in the region. There are reports of 800 redundancies, but the company says that services will improve, and more jobs will be created in other areas of the business. An arson attack caused inconvenience and disruption on a massive scale for businesses and residents. The unknown offenders poured accelerant into an installation carrying telephone wires, and set it alight, causing whole areas of Salford Quays to be completely severed from the phone network. A week later, reconnection is still in progress. Another prime sporting facility is to be built in Manchester, this time a new £30m swimming complex at UMIST, which will be used for the 2002 Commonwealth Games. The project won a record £19m in lottery money. 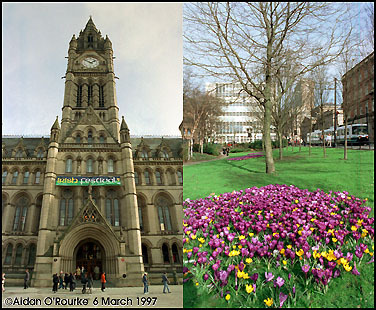 On the subject of sport, It was announced on Wednesday that Manchester has been chosen for the 1999 Gay and Lesbian Games. Civic leaders have hailed the decision as another major coup for the city, but a survey of Manchester Evening News readers revealed that three out of four callers didn't want the games to come to Manchester. There is widespread concern here about the fate of Cheshire teenager Louise Woodward, currently being held in Boston, and the decision to charge her with first degree murder. Many are of the opinion that she is not getting fair treatment under the American legal system. Despite this, her mother has said she is confident that Louise will be acquitted. After Manchester United's 4-0 victory over Porto last week, 19 jets will be carrying Manchester fans to Portugal for the return leg, in which United are predicted to consolidate their winning streak. A meteorite which fell into the garden of Little Lever resident John Cope may be sold for £20,000. The 18 pound lump of space rock, containing iron and nickel, is to be examined by Manchester University. The meteorite, incorrectly referred to by some as a "meteor", fell to earth in the late sixties. A blustery and rainy start to the week changed to bright sunshine and mild weather on Thursday. Saturday was bright and sunny, but cloudier weather is on the way. Current temperatures 55F/13C.